I have to admit that my fitness and exercise New Year's Resolution has officially bit the dust. I am desperate to incorporate a healthy workout regimen back into my day and have decided to begin walking, biking and running around my neighborhood in order to kick start my metabolism again and snap back into shape. When I run though, I like to be able to chart my progress in order to stay motivated. 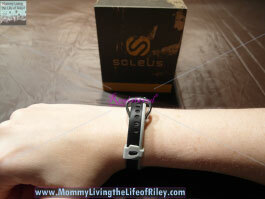 Thankfully, Soleus allowed me to review the Chicked Running Watch in black and gray. Keep reading to learn all about it! 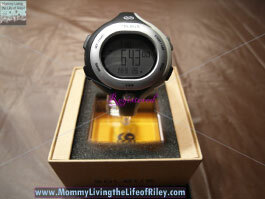 I reviewed the Chicked Running Watch in Black/Gray/Silver from Soleus, which retails for $55.00 with FREE SHIPPING. The Soleus Chicked Watch is a women's running watch with plenty of bells and whistles in a sleek and sporty design. Before I begin to tell you about the many wonderful features this watch has, I want to first describe the Chicked Running Watch's aesthetic appeal. It has a large oval face and large digital numbers which make it very easy to read while jogging about. The watch face and band are primarily black with a small gray stripe running down the right side. Because I have a very small wrist, I was happy to see that the watch's wristband had many different sizing holes spaced very close together. This was great for ensuring the perfect fit...not too tight and not too loose. I also loved how the end piece of the Chicked Running Watch from Soleus stayed in place via a unique notch in the watch's wrist band loop, as shown in the fourth picture below. I've never had a watch which fit better or was fastened so securely to my wrist. In order to withstand the elements when you run (or just your profusely sweating body), the Soleus Chicked Running Watch is water resistant to 100 meters and even has a bright back light for night time running. Time Mode - Set the time and calendar information for TWO time zones as well as apply a Power Save feature and activate the Button Chime. Chronograph Mode - Capture lap and total time data to 1/100th of a second. Can run for 20 hours and has a 30 lap memory. Data Mode - Saves 1 run or 30 laps. Data Mode will catalog total time, each lap split, best lap and average lap. Timer Mode - Has 5 segment timers which will countdown and beep for 5 seconds upon completion. Alarm Mode - Has 2 alarms that can be set to sound everyday. As you can see, the Chicked Running Watch from Soleus does it all, stylishly and durably. I love having this watch strapped to my wrist when I go walking, running or biking, for now I can instantly track my increasing fitness level, which is definitely motivating. If you are wanting to get out there and start running or walking on a regular basis, then I highly recommend the Chicked Running Watch to track your progress. It's a fashionable sport watch which can withstand whatever you dish out and keep coming back for more! 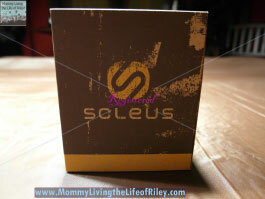 Disclosure: I received the Chicked Black/Gray/Silver Running Watch from Soleus in order to facilitate my review. No other compensation was received. This product review is based on my own personal experiences with this item and is completely honest and objective.